There are about 50 millions of deaf and hard of hearing people in USA and about 500 millions of them worldwide – which would make about 20% of the total population. 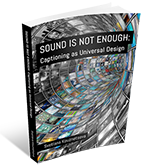 You may ignore that important market segment if your aural information is not accessible to them via quality captioning, transcriptions, and other types of visual access. The website owners themselves – captions allow for better indexing and searching of multimedia, eventually improving their ROI. 43% of people in USA with low literacy. According to Digiday, 85% of Facebook video is watched without sound. Plymedia reported that subtitles video viewership by almost 40%. AST reported that CNET-captioned video drove 30% increase in Google hits. Control over $4 trillion annually in the world – this market is about the size of China.